I think it’s fair to say certain stereotypes follow rural living, a common one being that quiet, little towns like Roseburg, Oregon, lack culture. Yeah, we’ve seen our fair share of tractor pulls and livestock auctions – precisely the types of events and activities people associate with a small Oregon town whose entire population would fit quite comfortably in the average-sized NFL stadium with plenty of room to spare. Unashamedly, we like that kind of stuff. It’s salt of the earth, blue collar and uniquely American. But Roseburg has plenty more to offer. Look no further than Music on the Half Shell, a Douglas County tradition that’s been a part of our community for a quarter century. Hundreds of thousands of visitors have come to listen to a wide variety of musical genres spanning from classical to country. 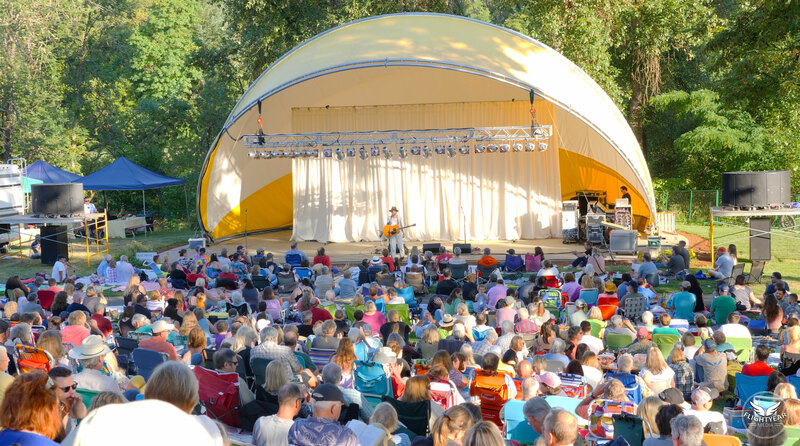 The annual summer lineup features eight Tuesday-night performances that in years past have included the likes of Robert Cray, Lyle Lovett, Alison Krauss, Joan Baez, Bruce Hornsby, Los Lobos, Etta James, and many others. The venue is pristine – the half shell sits in Stewart Park just feet from the softly rippling waters of the South Umpqua River. It’s common for attendees to place blankets on the grassy hillside fronting the half shell in the early morning hours before the Tuesday-evening shows to save their spots. When they return for the performance, they carry with them picnic baskets stuffed with a variety of cheeses, charcuterie and breads. As they sit on their blankets enjoying the music, attendees may open a bottle of their favorite pinot noir or cabernet from one of the Umpqua Valley’s famed wineries or enjoy a locally produced IPA or saison from a nearby craft brewery. Yeah, in the fall we love watching high school football under the Friday-night lights. And when the steelhead begin their winter run in the Umpqua, we’ll definitely brave the cold, wet weather to get a line in the water. But don’t paint us with such broad strokes. We sip on fine wine and small-batch whiskey. You might see us driving through town in a Tesla or BMW. And you’ll definitely find us every summer enjoying great performances at Roseburg’s own Music on the Half Shell. Umpqua Health is a proud Benefactor-level sponsor of Music on the Half Shell.